For other uses, see Motorola (disambiguation). Motorola designed and sold wireless network equipment such as cellular transmission base stations and signal amplifiers. Motorola's home and broadcast network products included set-top boxes, digital video recorders, and network equipment used to enable video broadcasting, computer telephony, and high-definition television. Its business and government customers consisted mainly of wireless voice and broadband systems (used to build private networks), and, public safety communications systems like Astro and Dimetra. These businesses (except for set-top boxes and cable modems) are now part of Motorola Solutions. Google sold Motorola Home (the former General Instrument cable businesses) to the Arris Group in December 2012 for US$2.35 billion. Motorola's wireless telephone handset division was a pioneer in cellular telephones. Also known as the Personal Communication Sector (PCS) prior to 2004, it pioneered the "mobile phone" with DynaTAC, "flip phone" with the MicroTAC as well as the "clam phone" with the StarTAC in the mid-1990s. It had staged a resurgence by the mid-2000s with the RAZR, but lost market share in the second half of that decade. Later it focused on smartphones using Google's open-source Android mobile operating system. The first phone to use the newest version of Google's open source OS, Android 2.0, was released on November 2, 2009 as the Motorola Droid (the GSM version launched a month later, in Europe, as the Motorola Milestone). The handset division (along with cable set-top boxes and cable modems) was later spun off into the independent Motorola Mobility. On May 22, 2012, Google CEO Larry Page announced that Google had closed on its deal to acquire Motorola Mobility. On January 29, 2014, Google CEO Larry Page announced that pending closure of the deal, Motorola Mobility would be acquired by Chinese technology company Lenovo for US$2.91 billion (subject to certain adjustments). On October 30, 2014, Lenovo finalized its purchase of Motorola Mobility from Google. Motorola started in Chicago, Illinois, as Galvin Manufacturing Corporation (at 847 West Harrison Street) in 1928 when brothers, Paul V. and Joseph E. Galvin, purchased the bankrupt Stewart Battery Company's battery-eliminator plans and manufacturing equipment at auction for $750. Galvin Manufacturing Corporation set up shop in a small section of a rented building. The company had $565 in working capital and five employees. The first week's payroll was $63. The company's first products were battery-eliminators, devices that enabled battery-powered radios to operate on household electricity. Due to advances in radio technology, battery-eliminators soon became obsolete. Paul Galvin learned that some radio technicians were installing sets in cars, and challenged his engineers to design an inexpensive car radio that could be installed in most vehicles. His team was successful, and Galvin was able to demonstrate a working model of the radio at the June 1930 Radio Manufacturers Association convention in Atlantic City, New Jersey. He brought home enough orders to keep the company in business. Paul Galvin wanted a brand name for Galvin Manufacturing Corporation's new car radio, and created the name “Motorola” by linking "motor" (for motorcar) with "ola" (from Victrola), which was also a popular ending for many companies at the time, e.g. Moviola, Crayola). The company sold its first Motorola branded radio on June 23, 1930, to H.C. Wall of Fort Wayne, Indiana, for $30. The Motorola brand name became so well-known that Galvin Manufacturing Corporation later changed its name to Motorola, Inc.
Galvin Manufacturing Corporation began selling Motorola car-radio receivers to police departments and municipalities in November 1930. The company's first public safety customers (all in the U.S. state of Illinois) included the Village of River Forest, Village of Bellwood Police Department, City of Evanston Police, Illinois State Highway Police, and Cook County (Chicago area) Police. Many of Motorola's products have been radio-related, starting with a battery eliminator for radios, through the first hand-held walkie-talkie in the world in 1940, defense electronics, cellular infrastructure equipment, and mobile phone manufacturing. In the same year, the company built its research and development program with Dan Noble, a pioneer in FM radio and semiconductor technologies, who joined the company as director of research. The company produced the hand-held AM SCR-536 radio during World War II, which was vital to Allied communication. Motorola ranked 94th among United States corporations in the value of World War II military production contracts. Motorola went public in 1943, and became Motorola, Inc. in 1947. At that time Motorola's main business was producing and selling televisions and radios. In October 1946 Motorola communications equipment carried the first calls on Illinois Bell telephone company's new car radiotelephone service in Chicago, Illinois. The company began making televisions in 1947, with the model VT-71 with 7-inch cathode ray tube. In 1952 Motorola opened its first international subsidiary in Toronto, Canada to produce radios and televisions. In 1953, the company established the Motorola Foundation to support leading universities in the United States. In 1955, years after Motorola started its research and development laboratory in Phoenix, Arizona, to research new solid-state technology, Motorola introduced the world's first commercial high-power germanium-based transistor. The present "batwing" logo was also introduced in 1955 (having been created by award-winning Chicago graphic designer Morton Goldsholl in late 1954). Beginning in 1958, with Explorer 1 Motorola provided radio equipment for most NASA space-flights for decades, including during the 1969 moon landing. A year later it established a subsidiary to conduct licensing and manufacturing for international markets. Motorola created numerous products for use by the government, public safety officials, business installments, and the general public. These products included cell phones, laptops, computer processors, and radio communication devices. In 1960, it introduced the world's first large-screen portable (19-inch), transistorized, cordless television. According to the 1962 Illinois Manufacturers Directory (50th anniversary edition), Motorola had 14,000 employees worldwide of which at least 5,823 employees in 6 plants were located in Illinois. The company headquarters were at 9401 West Grand Avenue in Franklin Park and it listed TV receivers, Stereo-Hi Fi equipment as the products at this plant made by 1,700 employees. The Communications Division was in Chicago at 4545 West Augusta Blvd. where 2,000 employees made electronic communications equipment. The Military Electronics Division was at 1450 North Cicero Avenue, Chicago where 923 employees made microwave and industrial equipment. Two more Chicago locations were listed at 4900 West Flourney Street and at 650 North Pulaski but no employee count was listed for these. The last plant was listed in Quincy, Illinois at 1400 North 30th Street where 1,200 employees made radio assemblies for both home and automobile. In 1963, it introduced the first rectangular color picture tube. In 1964, the company opened its first Research and development branch outside of the United States, in Israel, under the management of Moses Basin. The modular Quasar brand was introduced in 1967. In 1969, Neil Armstrong spoke the famous words "one small step for a man, one giant leap for mankind" from the Moon on a Motorola transceiver. In 1973, Motorola demonstrated the first hand-held portable telephone. In 1974, Motorola introduced its first microprocessor, the 8-bit MC6800, used in automotive, computing and video game applications. That same year, Motorola sold its television business to the Japan-based Matsushita - the parent company of Panasonic. In 1976, Motorola moved its headquarters to the Chicago suburb of Schaumburg, Illinois. In 1980, Motorola’s next generation 32-bit microprocessor, the MC68000, led the wave of technologies that spurred the computing revolution in 1984, powering devices from companies such as Apple, Commodore, Atari, Sun, and Hewlett Packard. 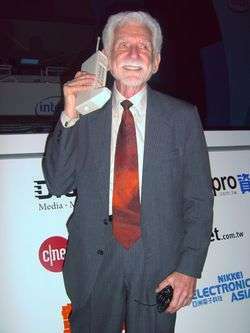 Dr. Martin Cooper of Motorola made the first private handheld mobile phone call on a larger prototype model in 1973. This is a reenactment in 2007. In September 1983, the U.S. Federal Communications Commission (FCC) approved the DynaTAC 8000X telephone, the world's first commercial cellular device. By 1998, cellphones accounted for two thirds of Motorola's gross revenue. The company was also strong in semiconductor technology, including integrated circuits used in computers. In particular, it is known for the 6800 family and 68000 family of microprocessors and related peripheral ICs; the processors were used in Atari ST, Commodore Amiga, Color Computer, and Apple Macintosh personal computers and in the early HP laser printers, and some 6800-family peripheral devices were used in the IBM PC series of personal computers. The PowerPC family was developed with IBM and in a partnership with Apple (known as the AIM alliance). Motorola also has a diverse line of communication products, including satellite systems, digital cable boxes and modems. In 1986, Motorola invented the Six Sigma quality improvement process. This became a global standard. In 1990 General Instrument Corporation, which was later acquired by Motorola, proposed the first all-digital HDTV standard. In the same year the company introduced the Bravo numeric pager which became the world's best-selling pager. In 1991, Motorola demonstrated the world's first working-prototype digital cellular system and phones using GSM standard in Hanover, Germany. In 1994, Motorola introduced the world's first commercial digital radio system that combined paging, data and cellular communications and voice dispatch in a single radio network and handset. In 1995, Motorola introduced the world's first two-way pager which allowed users to receive text messages and e-mail and reply with a standard response. In 1998, Motorola was overtaken by Nokia as the world's biggest seller of mobile phone handsets. On September 15, 1999, Motorola announced it would buy General Instrument in an $11 billion stock swap. General Instrument had long been the No. 1 cable TV equipment provider, supplying cable operators with end-to-end hybrid fiber coax cable solutions. This meant that GI offers all cable TV transmission network components from the head-end to the fiber optic transmission nodes to the cable set-top boxes, now at the availability of Motorola. GI's acquisition created the Broadband Communications Sector (BCS). In 1999, Motorola separated a portion of its semiconductor business—the Semiconductor Components Group (SCG)-- and formed ON Semiconductor, whose headquarters are located in Phoenix, Arizona. In June 2000, Motorola and Cisco supplied the world's first commercial GPRS cellular network to BT Cellnet in the United Kingdom. The world's first GPRS cell phone was also developed by Motorola. In August 2000, with recent acquisitions, Motorola reached its peak employment of 150,000 employees worldwide. Two years later, employment would be at 93,000 due to layoffs and spinoffs. In 2002, Motorola introduced the world's first wireless cable modem gateway which combined a high-speed cable modem router with an ethernet switch and wireless home gateway. In 2003, Motorola introduced the world's first handset to combine a Linux operating system and Java technology with "full PDA functionality". In 2004, Motorola divested its whole semiconductor business to form Freescale Semiconductor. The Motorola RAZR line sold over 120 million units, which brought the company to the number two mobile phone slot in 2005. In June 2005, Motorola overtook the intellectual property of Sendo for $30,000 and paid £362,575 for the plant, machinery and equipment. In June 2006, Motorola acquired the software platform (AJAR) developed by the British company TTP Communications plc. Later in 2006, the firm announced a music subscription service named iRadio. The technology came after a break in a partnership with Apple Computer (which in 2005 had produced an iTunes compatible cell phone ROKR E1, and most recently, mid-2007, its own iPhone). iRadio has many similarities with existing satellite radio services (such as Sirius and XM Radio) by offering live streams of commercial-free music content. Unlike satellite services, however, iRadio content will be downloaded via a broadband internet connection. As of 2008, iRadio has not been commercially released and no further information is available. In 2007, Motorola acquired Symbol Technologies to provide products and systems for enterprise mobility solutions, including rugged mobile computing, advanced data capture, and radio frequency identification (RFID). In 2010, Motorola sold its cellular-infrastructure business to Nokia Siemens Networks for $1.2 billion. In January 2011, Motorola split into two separate companies, each still using the word Motorola as part of its name. One company, Motorola Solutions (using a blue version of the Motorola logo), is based in the Chicago suburb of Schaumburg, Illinois, and concentrates on police technologies, radios, and commercial needs. The other company, Motorola Mobility (using a red logo), is based in Chicago (formerly in the Chicago suburb of Libertyville, Illinois), and is the mobile handset producer. The split was structured so that Motorola Solutions was the legal successor of the original Motorola, while Motorola Mobility was the spin-off. On August 15, 2011, Google announced that it would purchase Motorola Mobility for about $12.5 billion. On November 17, 2011, Motorola Mobility stockholders “voted overwhelmingly to approve the proposed merger with Google Inc”. On October 30, 2014, Google sold off Motorola Mobility to Lenovo. The purchase price was approximately US $2.91 billion (subject to certain adjustments), including US$1.41 billion paid at close: US $660 million in cash and US$750 million in Lenovo ordinary shares (subject to a share cap/floor). The remaining US$1.5 billion was paid in the form of a three-year promissory note. After the purchase, Google maintained ownership of the vast majority of the Motorola Mobility patent portfolio, including current patent applications and invention disclosures, while Lenovo received a license to the portfolio of patents and other intellectual property. Additionally Lenovo received over 2,000 patent assets, as well as the Motorola Mobility brand and trademark portfolio. Enterprise Mobility Solutions: Headquarters located in Schaumburg, Illinois; comprises communications offered to government and public safety sectors and enterprise mobility business. Motorola develops analog and digital two-way radio, voice and data communications products and systems, mobile computing, advanced data capture, wireless infrastructure and RFID solutions to customers worldwide. Home & Networks Mobility: Headquarters located in Arlington Heights, Illinois; produces end-to-end systems that facilitate uninterrupted access to digital entertainment, information and communications services via wired and wireless mediums. Motorola develops digital video system solutions, interactive set-top devices, voice and data modems for digital subscriber line and cable networks, broadband access systems for cable and satellite television operators, and also wireline carriers and wireless service providers. Mobile Devices: Headquarters located in Chicago, Illinois; designs wireless handsets, but also licenses much of its intellectual properties. This includes cellular and wireless systems and as well as integrated applications and Bluetooth accessories. Some of their latest gadgets are Moto X Gen 3, Moto X Play, Moto 360 smartwatch, etc. Motorola's handset division recorded a loss of US$1.2 billion in the fourth quarter of 2007, while the company as a whole earned $100 million during that quarter. It lost several key executives to rivals, and the web site TrustedReviews called the company's products repetitive and uninnovative. Motorola laid off 3,500 workers in January 2008, followed by a further 4,000 job cuts in June and another 20% cut of its research division a few days later. In July 2008, a large number of executives left Motorola to work on Apple Inc.'s iPhone. The company's handset division was also put on offer for sale. Also that month, analyst Mark McKechnie from American Technology Research said that Motorola "would be lucky to fetch $500 million" for selling its handset business. Analyst Richard Windsor said that Motorola might have to pay someone to take the division off the company's hands, and that Motorola may even exit the handset market altogether. Its global market share has been on the decline; from 18.4% of the market in 2007 the company had a share of just 6.0% by Q1 2009, but at last Motorola scored a profit of $26 million in Q2 and showed an increase of 12% in stocks for the first time after losses in many quarters. During the second quarter of 2010, the company reported a profit of $162 million, which compared very favorably to the $26 million earned for the same period the year before. Its Mobile Devices division reported, for the first time in years, earnings of $87 million. In 1974, Motorola divested itself of its television and radio-manufacturing division, which included the Quasar brand of electronics. This division was acquired by Matsushita, already known under its Panasonic brand in North America, where it was looking to expand. Motorola developed the global communication network using a set of 77 satellites. The business ambitions behind this project and the need to raise venture capital to fund the project led to the creation of the Iridium company in the late 1990s. While the technology was proven to work, Iridium failed to attract sufficient customers and it filed for bankruptcy in 1999. Obligations to Motorola and loss of expected revenue caused Motorola to divest the ON Semiconductor (ONNN) business August 4, 1999, raising about $1.1 billion. Motorola manufactured two satellite phone handsets for this network – the 9500 and 9505 as well as transceiver units. Some of these are still in production by an OEM but sold under the Iridium brand. Due to declines in business in 2000 and 2001, Motorola spun off its government and defense business to General Dynamics. The business deal closed September 2001. Thus GD Decision Systems was formed (and later merged with General Dynamics C4 Systems) from Motorola's Integrated Information Systems Group. On August 4, 1999, Motorola, Inc.'s Semiconductor Components Group, manufacturing Motorola's discrete, standard analog and standard logic devices was spun off, recapitalized and established as an independent company named ON Semiconductor. On Dec. 7, 2015 Freescale Inc. was sold to NXP Semiconductor, a European company. On January 29, 1988, Motorola sold its Arcade, New York facility and automotive alternators, electromechanical speedometers and tachometers products to Prestolite Electric. In July 2006, Motorola completed the sale of its automotive business to Continental AG. Motorola’s automotive unit had annual sales of $1.6 billion (€1.33 billion) and employed 4,504. The divisions products included telematics systems - like GM's OnStar used for vehicle navigation and safety services, engine and transmission control electronics, vehicle control, electronics and sensors used in steering, braking, and power doors and power windows. In 2000, Motorola acquired Printrak International Inc. for $160 million. In doing so, Motorola not only acquired computer aided dispatch and related software, but also acquired Automated fingerprint identification system software. In October 2008, Motorola agreed to sell its Biometrics business to Safran, a French defense firm. Motorola's biometric business unit was headquartered in Anaheim, Calif. The deal closed in April 2009. The unit became part of Sagem Morpho, which was renamed MorphoTrak. On March 26, 2008, Motorola's board of directors approved a split into two different publicly traded companies. This came after talk of selling the handset division to another corporation. These new companies would comprise the business units of the current Motorola Mobile Devices and Motorola Broadband & Mobility Solutions. Originally it was expected that this action would be approved by regulatory bodies and complete by mid-2009, but the split was delayed due to company restructuring problems and the 2008–2009 extreme economic downturn. On February 11, 2010, Motorola announced its separation into two independent, publicly traded companies, effective Q1 2011. The official split occurred at around 12:00 pm EST on January 4, 2011. The two new companies are called Motorola Mobility (now owned by Lenovo; cell phone and cable television equipment company) and Motorola Solutions (NYSE: MSI; Government and Enterprise Business). Motorola Solutions is generally considered to be the direct successor to Motorola, Inc., as the reorganization was structured with Motorola Mobility being spun off. On August 15, 2011, seven months after Motorola Mobility was spun off into an independent company, Google announced that it would acquire Motorola Mobility for $12.5 billion, subject to approval from regulators in the United States and Europe. According to the filing, Google senior vice president Andy Rubin first reached out to Motorola Mobility in early July 2011 to discuss the purchase by some of Google's competitors of the patent portfolio of Nortel Networks Corp., and to assess its potential impact on the Android ecosystem. Google boosted its offer for Motorola Mobility by 33% in a single day in early August, even though Motorola wasn't soliciting competing bids. The aggressive bidding by Google showed that the search engine company was under considerable pressure to beef up its patent portfolio to protect its promising Android franchise from a growing number of legal challenges. According to the filing, Google and Motorola began discussions about Motorola's patent portfolio in early July, as well as the "intellectual property litigation and the potential impact of such litigation on the Android ecosystem". Although the two companies discussed the possibility of an acquisition after the initial contact by Mr. Rubin, it was only after Motorola pushed back on the idea of patent sale that the acquisition talks picked up steam. The turning point came during a meeting on July 6. At the meeting, Motorola CEO Sanjay Jha discussed the protection of the Android ecosystem with Google senior vice president Nikesh Arora, and during that talk Jha told Arora that "it could be problematic for Motorola Mobility to continue to exist as a stand-alone entity if it sold a large portion of its patent portfolio". In connection with these discussions, the two companies signed a confidentiality and non-disclosure agreement that allowed Google to do due diligence on the company's patent portfolio. On July 21 and 23, Jha met with Arora and Rubin to discuss strategic options between the two companies, agreeing to continue to discuss a potential sale. On the morning of August 15, the two companies entered into a merger agreement at the offered price of $40. On November 17, Motorola Mobility stockholders approved the proposed merger with Google Inc. On April 17, 2013, ARRIS Group, Inc. (NASDAQ: ARRS) announced that it completed its acquisition of the Motorola Home business from a subsidiary of Google Inc.
On January 29, 2014, Google announced Lenovo plans to acquire the Motorola Mobility smartphone business. The purchase price is approximately $2.91 billion (subject to certain adjustments), including $1.41 billion paid at close: $660 million in cash and $750 million in Lenovo ordinary shares (subject to a share cap/floor). The remaining $1.5 billion will be paid in the form of a three-year promissory note. Google maintained ownership of the vast majority of the Motorola Mobility patent portfolio, including active patent applications and invention disclosures. As part of its ongoing relationship with Google, Lenovo received a license to this rich portfolio of patents and other intellectual property. Additionally Lenovo received over 2,000 patent assets, as well as the Motorola Mobility brand and trademark portfolio. On October 30, 2014, Lenovo finalized its purchase of Motorola Mobility from Google. Cambium Networks was created when Motorola Solutions sold the Canopy and Orthogon businesses in 2011. Cambium Networks has evolved the platform and expanded it to three product lines: Point to Point (PTP) (formerly Orthogon), Point to Multipoint (PMP) (formerly Canopy) and ePMP. The Six Sigma quality system was developed at Motorola even though it became best known through its use by General Electric. It was created by engineer Bill Smith, under the direction of Bob Galvin (son of founder Paul Galvin) when he was running the company. Motorola University is one of many places that provide Six Sigma training. Motorola, Inc., along with the Arizona Water Co. has been identified as the sources of trichloroethylene (TCE) contamination that took place in Scottsdale, Arizona. The malfunction led to a ban on the use of water that lasted three days and affected almost 5000 people in the area. Motorola was found to be the main source of the TCE, an industrial solvent that is thought to cause cancer. The TCE contamination was caused by a faulty blower on an air stripping tower that was used to take TCE from the water, and Motorola has attributed the situation to operator error. Of eighteen leading electronics manufacturers in Greenpeace’s Guide to Greener Electronics (October 2010), Motorola shares sixth place with competitors Panasonic and Sony). Motorola scores relatively well on the chemicals criteria and has a goal to eliminate PVC plastic and brominated flame retardants (BFRs), though only in mobile devices and not in all its products introduced after 2010, despite the fact that Sony Ericsson and Nokia are already there. All of its mobile phones are now PVC-free and it has two PVC and BFR-free mobile phones, the A45 ECO and the GRASP; all chargers are also free from PVC and BFRs. The company is also increasing the proportion of recycled materials that used in its products. For example, the housings for the MOTO W233 Renew and MOTOCUBO A45 Eco mobile phones contain plastic from post-consumer recycled water cooler bottles. According to the company’s information, all of Motorola’s newly designed chargers meet the current Energy Star requirements and exceed the requirements for standby/no-load modes by at least 67%. Motorola sponsored Scottish Premier League club Motherwell F.C. for 11 years. This long term deal ended after the company started to reduce its manufacturing operations in Scotland. The company also sponsored Livingston F.C. between 1998 and 2002. The company also had a plant on the edge of the town. However, this closed down at the same time as their sponsorship with the club ended. The South Stand at Livingston's Almondvale Stadium, was named after the company, during their time of sponsorship. The company also sponsored a cycling team that counted Lance Armstrong amongst its members. Motorola is also a sponsor of Danica Patrick, David Beckham, and Fergie. It also sponsored the Richmond Football Club in the Australian Football League from 2004 to 2007. Motorola sponsored São Paulo FC from 2000 to 2001. Motorola also sponsored Club Bolívar since 2008. Motorola awarded TrackIT Solutions for being "The company with most Innovative Enterprise Mobility Solution" in 2010. In Madden NFL 07 franchise mode, a Motorola phone is used to communicate with coaches and agents. Robby Gordon was sponsored by Motorola in 2007 and 2008. Motorola is on Gordon's car in NASCAR 07 and NASCAR 08. 1 2 "Motorola Solutions, Inc. 2013 Annual Report Form (10-K)" (XBRL). United States Securities and Exchange Commission. February 13, 2014. ↑ Ante, Spencer E. (January 5, 2011). "Motorola Is Split Into Two". The Wall Street Journal. Retrieved January 4, 2011. 1 2 "Motorola Solutions Inc: NYSE:MSI quotes & news – Google Finance". Google. Retrieved July 12, 2011. ↑ Gelles, Claire Cain Miller and David. "After Big Bet, Google Is to Sell Motorola Unit". Retrieved 26 June 2016. ↑ "We've acquired Motorola Mobility". Google Official Blog. Retrieved May 22, 2012. ↑ Lenovo to Acquire Motorola Mobility from Google – Investor Relations – Google. Investor.google.com. Retrieved on 2014-01-30. 1 2 "Hello Moto". Lenovo. Retrieved October 30, 2014. ↑ "Joseph E. Galvin (1899 - 1944) - Find A Grave Memorial". Retrieved 26 June 2016. ↑ "Paul Vincent Galvin (1895 - 1959) - Find A Grave Memorial". Retrieved 26 June 2016. ↑ “Calling All Cars,” Motorola Solutions History, accessed November 5, 2014, http://www.motorolasolutions.com/US-EN/About/Company+Overview/History/Explore+Motorola+Heritage/Calling+All+Cars. 1 2 Hempel, Jessi (September 28, 2009). "Motorola gets in the game". CNNMoney.com. Retrieved May 30, 2012. ↑ "Historic News Releases". Motorola Inc. Retrieved July 12, 2011. ↑ These include the MC6845 CRT Controller—used in the MDA and CGA adapters and the PCjr and emulated in the EGA, MCGA, and VGA—and the MC146818 real-time clock in the IBM AT. ↑ "ON Semiconductor". ON Semiconductor. Retrieved April 18, 2013. ↑ "Motorola layoffs". Chicago Tribune. 28 June 2002. Retrieved 9 January 2015. ↑ King, Ben (September 28, 2005). "How Britain lost Sendo". The Register. Retrieved January 16, 2011. ↑ "Motorola acquires TTPCom AJAR Software Platform". Motorola Inc. Retrieved July 12, 2011. ↑ "iRadio". Motorola Inc. Retrieved February 3, 2008. ↑ "Google's Motorola acquisition: Nail in the Android patent coffin?". ZDNet. Retrieved 2012-02-19. ↑ "Motorola Mobility Stockholders Approve Merger with Google". Motorola Mobility, Inc. November 17, 2011. Retrieved November 28, 2011. ↑ "Motorola Mobility – Motorola Solutions – About Motorola – Directional Landing Page". Motorola Inc. January 4, 2011. Retrieved July 12, 2011. ↑ "Motorola CTO Richard Nottenburg takes off". Engadget. Retrieved July 12, 2011. ↑ "Motorola Phones Sales Crash 38 Per Cent". TrustedReviews. Retrieved July 12, 2011. ↑ "Motorola cuts another 4,000 jobs". Engadget Mobile. Retrieved July 12, 2011. ↑ "Motorola sues former employee turned Apple exec for ganking trade secrets". Engadget. Retrieved July 12, 2011. ↑ "Motorola insider tells all about the fall of a technology icon". Engadget. Retrieved July 12, 2011. ↑ Olga Kharif and Roger O. Crockett (July 10, 2008). "Motorola's Market Share Mess". BusinessWeek. Retrieved August 4, 2008. ↑ "Motorola ends fiscal Q2 with healthy profit – GSMArena.com news". Gsmarena.com. Retrieved July 12, 2011. ↑ "Detailed History". Prestolite Electric Inc. Retrieved 2012-06-13. ↑ "Motorola Mobility, Inc. – Media Center – Press Releases – Motorola Targets First Quarter 2011 to Separate into Two Independent, Publicly Traded Companies". Mediacenter.motorola.com. February 11, 2010. Retrieved July 12, 2011. ↑ Balazs, Diana (May 9, 2008). "Companies trying to prevent PV water pollution". The Arizona Republic. Retrieved July 12, 2011. 1 2 "Greenpeace – Guide to Greener Electronics". Greenpeace International. Retrieved January 12, 2011. ↑ "Motorola – Material content". 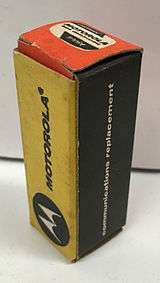 Motorola. Retrieved January 12, 2011. ↑ "Motorola – Energy efficiency". Motorola. Retrieved January 12, 2011. Wikimedia Commons has media related to Motorola. "For Google, The Motorola Deal Was All About The Patents At First", by Spencer E. Ante, The Wall Street Journal, Sep 14, 2011.